Remember back in Part 4 when I said I was expecting the game to throw a six-headed snake demon at me? It turns out I was only five heads off the mark. Perhaps I’m becoming a little prescient in my old age. Or maybe I’ve played a Soulsborne before. Alternatively, a giant, evil white snake (the animal not the band) might be the natural progression from poison spitting geckos and man-sized roosters. More on that in a moment. 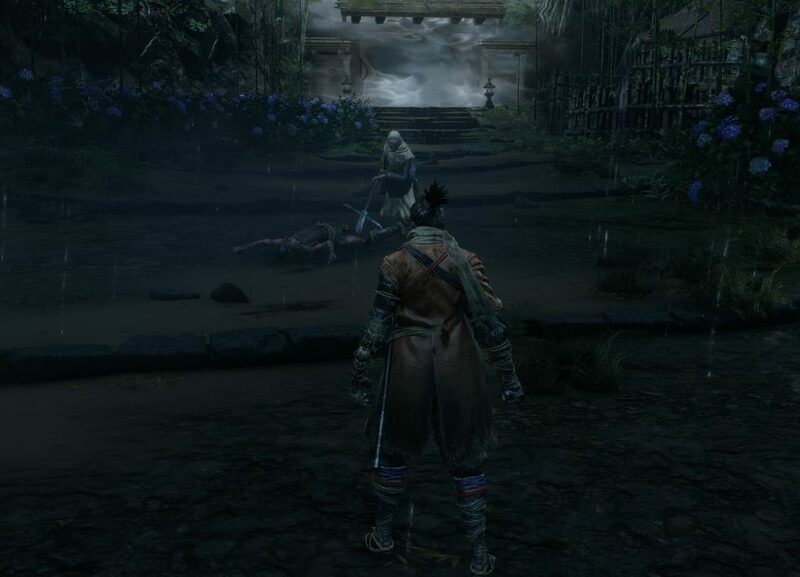 After I put General Yamauchi to the sword, Sekiro took me on a scenic tour of places where I had no business showing my face. 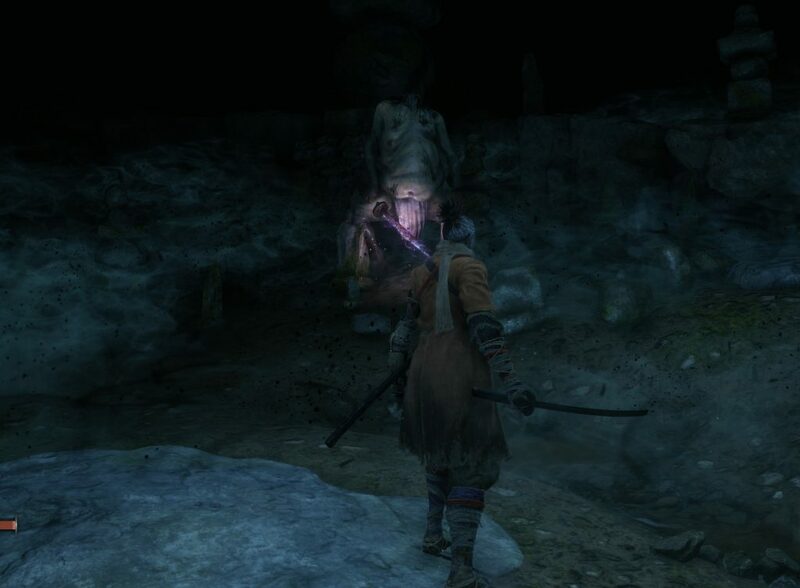 My first stop on the oh-hell-no tour of Sengoku Japan was the cave of the headless. This is exactly what it sounds like. A warning note from a long since scampered samurai told me that if I ventured onward, I was braving the territory of the undead. A place housing terrifying things that were immune to both sword and spear. Yet the game pushed me forward, giving me some magic confetti that made the incorporeal, corporeal. I wasted the confetti amid two utter failures to cross steel with the poison spewing, speed slowing Headless. There was no third attempt. The two deaths were also enough to have the game inform me that my buddy the merchant/reformed thief contracted Dragon Rot. That’s three NPCs sick because of my failures. Would speed running my way through the game mean that none of the innocent bystanders would get sick? Taking the path beyond where I killed General Yamauchi led me through snake canyon. Snake. Why did it have to be snake? What twisted god would birth a snake whose scales are thick enough to turn a blade? I wish I could say that I made it all the way through this tense environmental puzzle without failure. 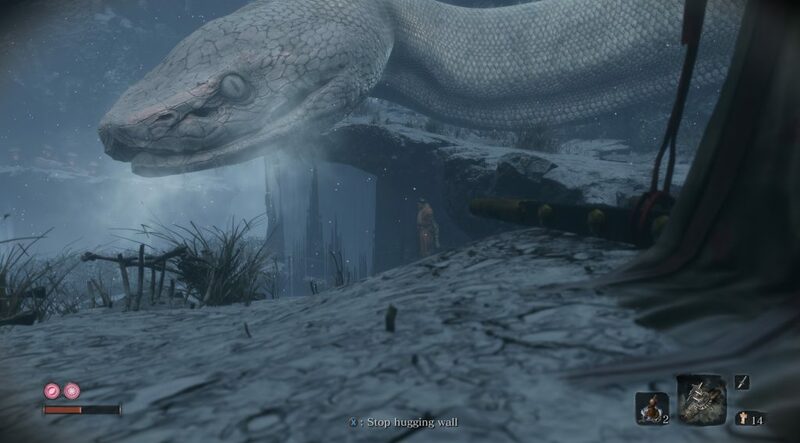 Despite my best grappling, hanging, and hiding in the shadows, Okami once ended up a snack for this perversion of the natural world, and once was booped into a bottomless chasm by the snake. The one thing I took from this temporary detour into man versus nature is that Sekrio’s level design and sense of scope is no less majestic than what I saw in Dark Souls. Okami, the undying samurai slaying revenant, is nothing but a morsel of meat, desperately clutching to stone and steel as he works his way through misty canyons the snake calls home. This is the snake’s space, and I am the intruder. Samurai, thieves, and assorted monstrosities might want to kill Okami, but the mood in this sequence was decidedly different. Here, the snake is the hunter. Hug the wall, stay alive. My return from the canyon’s depths led me to my first meeting with a general on horseback. I don’t recall his name. There was also a phantom sequence between Lord Kuro and his captor. 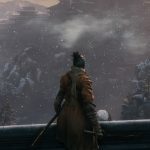 It shed more light on the broader strokes of the Sekiro’s conflict, but I’m going to come back to that in a later post. General what’s-his-face dispatched me with such ease that I knew I was not ready to fight him. Also, there was a samurai weeping for a dead horse while talking about gunpowder. Since General oh-gods-he-is-so-beefy was on horseback, I assume that I need to find some sort of horse spooking weapon before taking him on. This left me with one path left to take: a return to the past. 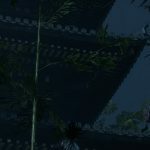 My friend, the thief, reminded me that there was probably some valuable swag worth stealing in a three-story pagoda on the way to the pinnacle of the Hirata Estate. I struck out on the winding mountain path, having used the short-cut to face Captain Spewface during the first go-round. A thought occurred as I dashed through the shadows, avoiding thieves and chickens alike, reveling in the rush of Okami’s kinetic movement. Did I infect my friend the thief with Dragon Rot in the past or the present? What if his health declined so quickly in the present because Okami had been siphoning his life force for the three years between the Hirata Estate arc and the game’s present? 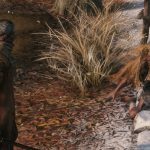 A fight with a shinobi hunter cut my meditation short. I’m not sure if the hunter counts as a boss or a general, but for book keeping purposes I’m going to chalk him up as a boss. The challenge in putting him to the blade was clearing the area of his buddies. Three- and four-on-ones are nothing but trouble. Taking down the hunter, himself, demanded nothing more than a bit of nerve and timing in executing the mikiri counter. If you pizza when you should mikiri, you’re going to have a bad time. The mikiri is a high-risk move that involves stepping into an attack, and I love it as an element of the game. It stands as a mechanical break from the Souls games, where rolling around like an idiot was a perfectly viable defensive strategy. Sticking the landing on a mikiri involves reading an enemy’s intention and responding with a precise movement. Success is highly rewarded as damage against an enemy’s posture. Failure…well let’s just say that the outcome of charging into a stabbing attack is as bad as you might imagine. The other thing the mikiri counter and the battle against the shinobi hunter did was to put me in mind of Knights of Sidonia. Your mileage may vary on that reference. Early on in Sidona’s first season a garde (i.e. big robot mecha) pilot wins a duel because he steps into an opponent’s attack. This idea of pressing rather than evading is what keeps many a garde pilot alive in the series. 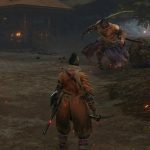 Embracing my inner Tanikaze is what helped me win the fight with the shinobi hunter in a fraction of time I spent on the ogre. I wonder if there is some life philosophy here. What’s the business version of jumping on a blade as it thrusts toward one’s chest? Hey google, show me TED Talks on stepping into a blade.